bathroom for years to come. 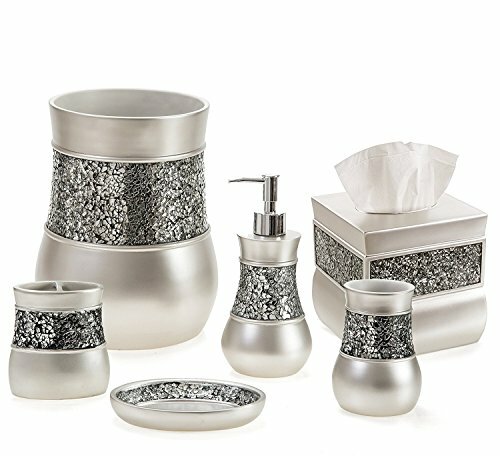 your set and get a complete accessories kit to handle every function in the bathroom. - Includes 6 items to give you great value for money. - The silver crackled mosaic design works with any décor. - Made using rust-resistant resin that retains its look. - Sized to optimize functionality and fit all kinds of bathrooms. - Backed by a no-hassle, 100% money-back guarantee. Click 'Add to Cart' now to get your set completely risk-free! SET OF 6: Has a Soap Dispenser, Toothbrush Holder, Tumbler, Soap Dish, Tissue Cover & Wastebasket. DURABLE DESIGN: Every Accessory is Made Using Rust-Proof Heavy Resin for Enhanced Durability. DECORATIVE LOOK: Elegant Silver Hue and Crackled Mosaic Glass Accentuates Any Bath Decor. MULTIPLE USERS: Large Enough for Multiple User's in Secondary Guest Bathroom, Powder Room or Master Bathroom. GREAT GIFT IDEA: Makes a Unique Housewarming or Hostess Gift That Leaves a Lasting Impression.